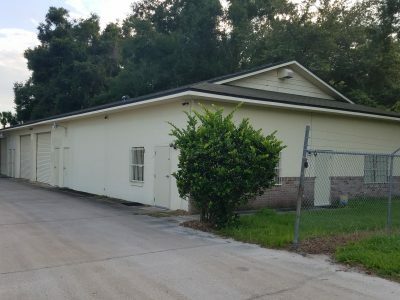 Restaurant building for lease near downtown DeLand. 1,710 SF, Free-standing, 23 paved parking spaces; 18′ vent hood; kitchen 27’x19′, 9’ceilings, 7’x10′ walk-in cooler, fire suppression system, $2,000/mo Triple Net Lease. Zoning is C-2 General Commercial, City of DeLand. The property could be used for other commercial uses. 2500 East International Speedway Boulevard in DeLand. Long Time Vehicle Related Sales Location (Truck Stuff) Owner will Sell or Lease. 4,200sf building with fenced yard. On Highway A1A Steps to the Beach! Steps from Public Access to Atlantic Ocean. 7,000sf warehouse with 1,500sf office space. In the center of town for quick trips to all of West Volusia. Commercial & Industrial Warehouse/Office Unit consisting of 5,000 square feet with 1,300 square feet of air conditioned office. 14 foot roll up door adjacent to office. Shared parking with adjacent tenant (stone company). Lease rate $3,000 a month. Ready for occupancy. Professional building on busy Hwy 44 (New York Ave.) near Amelia Avenue. Just steps from the Volusia County Justice Center. Over 2,200sf of space in the process of being completely remodeled. Three large offices and conference room, waiting area and large open work space. New bathrooms and break room. Come see the space to appreciate it. Suite A-B 4,000sf (+3,000sf storage+/-) $2,400/month Large office space with warehouse! Warehouse & Office Space can be rented together or separately. LEASED! Suite D – 2,000sf- $1,200/month LEASED! Suite E – 2,000sf $1,250/month LEASED! Established Car Lot with sales office. Median cut for westbound traffic and 300′ frontage on International Speedway Boulevard.